Prime 50mm lenses mean different things to different people. If you’re shooting with a full-frame DSLR or mirrorless camera, it’ll be a standard prime that gives an entirely natural perspective for general shooting. On an APS-C body, the same lens will have an effective focal length of 75mm (80mm for Canon), making it a better fit for portraiture. Shrink down to a Micro Four Thirds camera, and a 50mm lens will have an 100mm effective focal length, more suitable for really tight portraits and short telephoto shooting. In fact, the MFT lens in this test group is a bit less than 50mm: its 42.5mm focal length equates to 85mm in full-frame terms. Many regard that as spot-on for portraiture. Whichever camp you’re in, a ‘nifty fifty’ might well be the only prime lens you ever buy, so it pays to get a good one. Even so, nobody likes spending over the odds. We’ve sought out lenses that give great performance at a variety of price points. Nikon's standard prime for its full-frame mirrorless Z cameras packs a 12-element optical stack which includes two ED glass elements as well as two aspherical elements to boost contrast and vibrancy. Externally, the Z 50mm is noticeably bigger and heavier than a good old F-mount Nikkor AF-S 50mm f/1.8G, but compared with some F-mount 50mm alternatives from Sigma and Tokina, it’s pleasingly portable. The lens barrel features just a single AF/MF switch, but the wide, tactile and precise manual focus ring isn’t redundant if you’re using autofocus, as it can also be set in-camera to adjust exposure compensation or ISO sensitivity. Nikon has made much noise about the Z-mount's larger 55mm inner diameter and shortened distance between lens flange and image sensor, versus Nikon's F-mount. It's all supposed to add up to increased image quality. This isn't just hype though, as the Z 50mm is terrifically sharp, only fractionally down on the significantly pricier Z 35mm f/1.8 S, and that’s the sharpest lens we’ve ever tested. Aberrations are practically non-existent at any aperture, as is distortion, and the lens's stepping motor autofocus never missed its mark in our testing. Designed to be the start of a high-end Opera series, this lens is positioned above the company's AT-X lens line and rivals Sigma and Tamron’s latest premium offerings. Inside is a 9-element optical stack that contains three SD (Super-low Dispersion) elements and one aspherical element to minimise chromatic aberrations, while a new ELR (Extremely Low Reflection) coating reduces ghosting, flare and reflections. The Opera 50mm is dust and moisture resistant, and though its AF system is of the ring-type ultrasonic variety rather than a more modern stepping motor design, it's fast and reliable. But it's the Opera's image quality that impresses most. Sharpness is excellent, even wide open at f/1.4, becoming simply sublime from f/2 right through to f/11. Purple fringing is very well controlled, right at the corners of the frame, and you can forget about distortion, as there simply isn't any. The Opera 50mm will cost you a sizeable chunk more cash than the already-pricey Sigma 50mm f/1.4 DG HSM | A, but it is the new sharpness benchmark for a Canon or Nikon DSLR standard prime. Sigma’s previous 50mm lens was renowned as being a heavyweight, but the replacement ‘Art’ edition really piles on the grammes. It gains 50 per cent in physical length and rises from 505g to 815g in weight. The main reason for the Art lens’s weight gain is that it has a much more complex and sophisticated optical path than its predecessor, based on 13 rather than eight elements. These include one complex aspherical element and three SLD (Special Low Dispersion) elements. Build quality feels superb, although there are no weather-seals and the focus ring doesn’t quite have the tactile fluidity of a lens like the Zeiss Milvus. But you can count on the Sigma’s autofocus system to be fast and accurate. The Sigma is amazingly sharp, even at f/1.4, along with soft, creamy bokeh. Sharpness only drops off at f/1.4 in the extreme corners of the image frame. Colour fringing is very minimal at any aperture, even at the corners of the frame, and barrel distortion is absolutely negligible. Not quite a 50mm lens, the Tamron 45mm gives a slightly more generous viewing angle of 51 degrees rather than the more usual 46 degrees on a full-frame body. Unlike competing Canon and Nikon 50mm lenses, it combines an f/1.8 aperture rating with four-stop stabilisation. It’s physically smaller than some competing lenses from the likes of Sigma and Zeiss, and rather lighter at 540g. The Tamron features extensive weather-seals and a fluorine coating on its front element. The ring-type ultrasonic autofocus system enables the usual manual override. Sharpness is very good even at wide apertures of f/1.8 to f/2.8, although it loses out slightly to the Sigma 50mm f/1.4 DG HSM | A. Defocused areas look very soft, and the crossover between sharp and blurred areas has a nicely smooth transition. Sharpness is respectable, even at maximum aperture, and both lateral and longitudinal chromatic aberrations are minimal and hard to spot. Barrel distortion is slightly more prominent than the competing Sigma 50mm Art lens, but its nothing severe. Bokeh continues to impress when stopping down a bit from wide-open shooting, helped by a well-rounded aperture based on nine diaphragm blades. Who needs autofocus when image quality looks this good? Autofocus cameras have been around since 1977, so it might seem strange that Zeiss is still doggedly making manual-focus lenses. However, the range of Milvus prime lenses certainly gives a hands-on, feel-good factor. The 50mm f/1.4 is typical in having a beautifully engineered metal barrel and a full set of weather-seals. The optical design is based on Zeiss’s legendary Distagon principles. The long rotational travel of the focus ring helps focusing precision, and its super-smooth fluidity makes focusing a joy. The Nikon edition has a physical aperture ring with a de-click facility, to enable smooth aperture transitions during movie capture. This ring is absent on the Canon edition. Living up to its reputation and price tag, the Milvus delivers gorgeous image quality. Wide-open, it combines superb contrast and stellar sharpness across almost the entire frame. There's beautiful bokeh, and the lens maintains a lovely smoothness in defocused areas when stopping down a little. Colour fringing is almost a complete non-issue with this lens, even in the corners. There’s a little more distortion than in Tamron's SP 45mm f/1.8 Di VC USD, but less than in competing 50mm primes from Canon and Nikon. 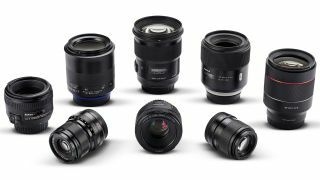 Renowned for its quality yet reasonably priced manual focus prime lenses, Korean manufacturer Samyang has recently started making autofocus lenses, mostly for Sony’s full-frame E-mount fit. There are currently five E-mount lenses to choose from, plus two Canon EF and one Nikon F. This 50mm optic gives the ‘standard’ perspective on Sony’s A7 and A9 cameras, with a fast aperture rating of f/1.4. Physically, it’s about twice as long as Canon and Nikkor 50mm f/1.4 lenses for full-frame DSLRs. The solid construction features mostly metal barrel parts and, contributing to its hefty 585g weight. This Samyang's performance doesn't disappoint. Sharpness is very uniform across the frame at f/1.4 and becomes excellent at f/2, where contrast is also excellent. Vignetting is quite severe until you hit f/2.8, but fringing is particularly negligible and there’s very little barrel distortion. Available in black or silver, there’s no denying that the Fujifilm XF50mm looks a bit pricey for an f/2 lens. Indeed, it has the slowest aperture rating of any lens in this test group. However, it’s impeccably built, with comprehensive weather-seals, a physical aperture ring for refined Aperture Priority and Manual mode shooting, and a high-grade optical path that includes an aspherical ED (Extra-low Dispersion) element. The nine-blade diaphragm is well-rounded. Autofocus is virtually silent. As with other ‘stepping motor’ systems, the focus ring is electronically coupled and, in this case, enables particularly precise manual control. On Fujifilm X cameras, the lens has an effective focal length of 75mm and delivers a tight depth of field at f/2, making it a great portrait lens. Wide-open sharpness is excellent across the entire image frame, there’s very good resistance to ghosting and flare, and fringing is practically impossible to spot at wide apertures. There’s a very slight hint of pincushion distortion, but it’ll generally go unnoticed. Compared with a Nikon-fit Sigma 50mm f/1.4 DG HSM | A or a Zeiss Milvus 50mm f/1.4, Nikon’s own-brand lens is only half the physical length and about a third of the weight. It’s simpler than the Sigma, with eight rather than 13 optical elements, and rather less robust than the metal-jacketed Zeiss. A further sign of the downsizing is that the Nikkor only has a 58mm filter thread, which is quite small for a 50mm f/1.4 lens. The straightforward optical path doesn’t contain an aspherical element (as featured in Nikon’s more budget-oriented 50mm f/1.8), and there are neither any ED (Extra-low Dispersion) elements nor any Nano Crystal Coat. Autofocus accuracy is more critical in very wide-aperture lenses and the Nikkor does well in this respect, unlike Canon’s f/1.4 counterpart. Sharpness is average at f/1.4, but stop down to f/2.8 and this lens delivers superb sharpness across the entire image frame. Lateral chromatic aberrations are minimal, though longitudinal fringing is present when wide-open. A nine-blade diaphragm helps to maintain smooth bokeh when stopping down a little. The only weak link is distortion, which is worse than we'd like for a standard prime. Overall, this lens is worth the extra outlay compared with Nikon’s f/1.8 optic. Canon’s 25-year-old 50mm f/1.4 lens might seem the obvious choice, but we prefer this newer option. It’s two-thirds of an f/stop slower, but is less than a third of the price, is much lighter and has better performance. Unlike previous f/1.8 editions, the ‘STM’ model has a stepping motor autofocus system that gives speedy yet quiet operation. The focus ring no longer rotates during autofocus, which improves handling, as well as enabling manual override in Single AF mode. The lens has a metal rather than plastic mounting plate, and a better-rounded aperture based on seven diaphragm blades instead of just five. After testing multiple samples of the Canon 50mm f/1.4 and f/1.8 lenses, we've found the f/1.8’s autofocus system to be much more accurate and reliable than its older sibling. Sharpness is also better than from Canon’s 50mm f/1.4 lens, from the centre to the edges. Colour fringing is minimal at wide apertures and negligible at other apertures. There’s a little more distortion than with some rival lenses, but it’s rarely noticeable. Considering its accessible pricing, this lens is a great value budget buy. Micro Four Thirds lenses only need to produce a relatively small image circle, and this Panasonic is typically compact and very light at only 130g - a fraction of the weight of some premium prices for DSLR cameras. With its effective focal length of 85mm, the Panasonic is ideal for portraiture and the f/1.7 aperture enables a fairly tight depth of field. It’s well-engineered and features an optical image stabiliser. This makes it ideally suited to Panasonic cameras; for Olympus bodies with sensor-shift stabilisation, we’d go for the Olympus M.Zuiko Digital 45mm f/1.8. Autofocus is quick and accurate, while colour fringing is essentially a non-issue, as even Raw files are automatically corrected. There’s the merest touch of barrel distortion but you’re unlikely to notice it. Sharpness is good, but not great, and many other rival optics manage better centre-frame sharpness. With its relatively ‘telephoto’ effective focal length, this lens's optical stabilisation will clinch the deal for MFT shooters whose cameras don’t have an in-body stabiliser.